Thanks to @chicagosean from StockTwits, who pointed out very helpful data visualizations of social media participation. The above chart is a heatmap of stocks broken down by sector, sized for number of mentions on the StockTwits site, and color coded for whether the posts were dominantly bullish or bearish. Also available on the StockTwits site is a breakdown of the stocks experiencing the greatest gains and declines in social volume. 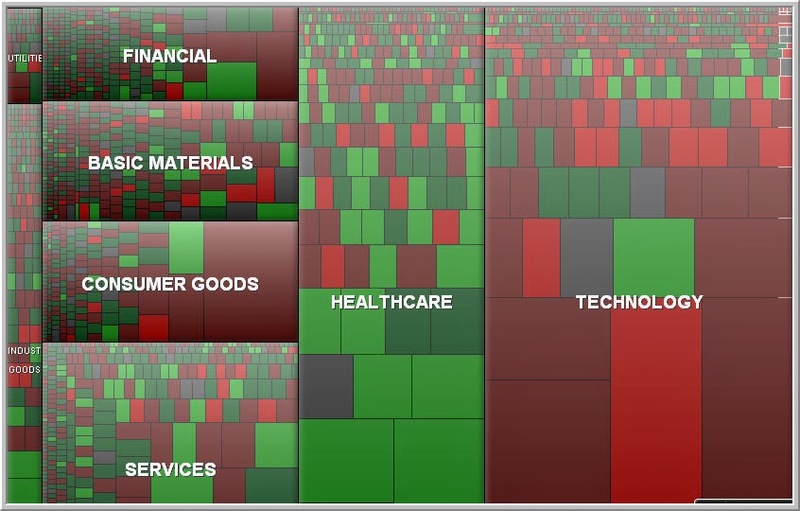 Finally, there is a breakdown of the most active participants on the StockTwits site, broken down by sector. It's an interesting way to think about speculative sentiment and shifts in sentiment. Three things I'd be curious about would be: 1) stocks with low but growing social volume and the implications for trending and volatility; 2) stocks with high but topping social volume and the implications for trend reversal; and 3) social volume across all stocks and its relationship to general movements in the broader sector and market indexes.